I couldn't agree more with the blogger's commentary. Comments on last night's post struck me as very shallow and unsympathetic to the victims of this natural disaster. There are other channels so if you don't like CNN/AC360's coverage I suggest trying an alternative. @Phebe: Just like AC360 did rarely mention the desaster in India that killed over a thousand people and viewers in most other countries were not exactely interested, many feel about the tornados. That's news for you. They pick out a crime or desaster and focus all their sympathy on it but you can't expect of the viewers to follow like robots. People usually don't care much if it doesn't happen close to you, in your country or to people you know and we were just being honest about it. Now I agree that Anderson absolutly shines when he's out in the field reporting from natural desasters and interviewing people. But in the end this happens every year and I will reserve the right to weight severity and death toll of this against, say, a big hurricane or tsunami just like some people weighted Benghazi against the death toll of the Iraq war. Yes, that was cynical and I don't really think like that. To be frank, apart from important international news, the homophobic hate crimes in NY I find far more important and relevant. A tornado is a force of nature, those hate crimes are a scary development and caused by human hatred. So while I am sure Anderson will provide some excellent cover of the tornado desaster, this recent trend to focus completely and maybe always a tad to extensively on one event because it's great for the ratings comes at the cost of everything else. And yes, I will switch to other channels that cover the stuff I am interested in if AC360 won't do it for most likely the entire week or I'll just read about it. 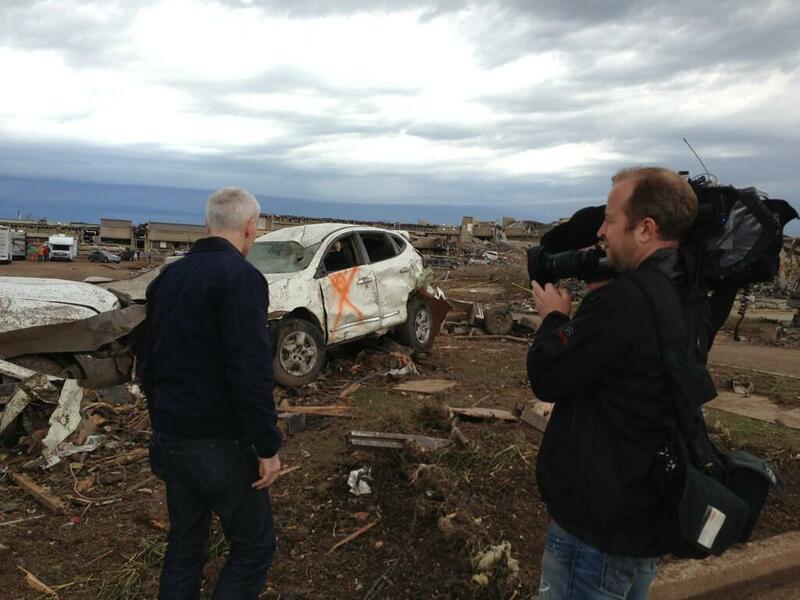 Yes, natural disasters happen around the world, but Anderson/AC360 is based in the U.S. and covers mostly U.S. news. The viewers that drive ratings are U.S. viewers and all you need to do is look at the ratings for AC360 when Anderson was in Boston, Cleveland and now covering the Moore, OK tornado to see where what stories draw viewers. Anderson/AC360 numbers on these stories are close to what his nightly ratings used to be before the downturn in 2009. While Anderson may be the highest rated anchor on CNN most nights, his numbers are pitiful compared to what they used to be. CNN PR can put a lot of spin on things, I look at the actual numbers and his studio numbers on a routine basis are not that good and all of CNN is a small fraction of it's former self. While I agree that CNN sometimes hangs on to a story too long, Michael Jackson's death and the NOLA oil spill are two that stick out in my mind; two or three days in Moore, OK doesn't fall into that category IMO. While you may find the homophobic hate crime that happened in NYC far more important and relevant, as a viewer, I don't. I'm not trying to downplay the incident, but it was one incident and a local/regional story at best. Lots of bad things happen across the U.S. and the world every day that don't make national news. And CNN/AC360's one sided booking of guests being almost completely Republican and former Bush administration employees is a total turn off to many viewers. I've watched Anderson and AC360 for many years. There was a time when panels and guests were balanced, but that's not the case today. 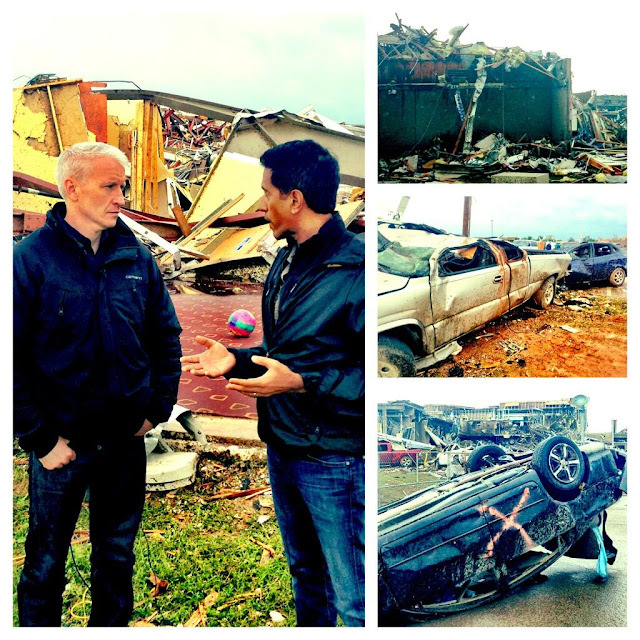 AC360 has it's ups and downs and certain stories appeal to individual viewers, but not others. By all means if a story doesn't interest you, change the channel. Apparently a lot of people aren't changing the channel on the Moore, OK tornado story, but rather many more are tuning in - look at the ratings. I think Anderson shines in his field reporting. Did the tsunami, Haiti Earthquake, famine in Somalia effect me,no, but I like hearing stories of survival and everyday people stepping up to aid their fellow man/woman. I think it's important to hear other people's stories and that Anderson gives a voice to people who want their stories to be heard. I realize that everyone has different opinions and different interests, that's what makes the world go round, that's what remote controls are for. Anderson has commented more than once on how he's inspired by people rushing to help others when disaster strikes, how he didn't want to leave Haiti or Boston, because he likes the feeling of people helping others and feeling honored to tell their stories. It's obvious that Anderson likes being in the field. If you are looking for a studio only anchor that covers a variety of topics, perhaps Anderson/AC360 is not the anchor/program for you.